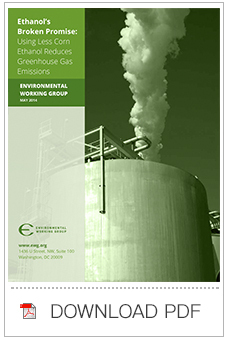 The proposed cut in the corn ethanol mandate would reduce greenhouse gas emissions by 3 million metric tons of carbon dioxide equivalent. Studies that claim that corn ethanol reduces emissions do not properly account for the constraints on increasing crop yield and significantly underestimate the emissions from land use change driven by the corn ethanol mandate. The intent of the Renewable Fuel Standard was to reduce greenhouse gas emissions, diminish America’s dependence on foreign oil and promote development of advanced biofuels. Instead it has resulted in rapid expansion of corn ethanol production, increasing greenhouse gas emissions, worsening air and water pollution and driving up the price of food and feed.